Crazy Quilt: Homage To Magritte, ink on paper with collage, 55 in x 36 in, 1996-1999. Crazy Quilt: Homage To Magritte (detail), ink on paper with collage, 1996-1999. 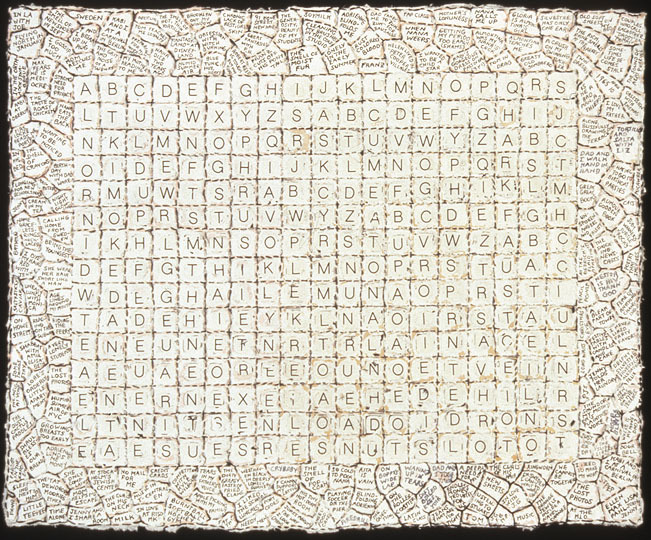 Words And Pictures, ink on paper with collage, 12 in x 18 in, 1996. Words And Pictures (detail), ink on paper with collage, 12 in x 18 in, 1996. Equivalents, ink on paper, 18 in x 24 in, 1998. Greater Than/Less Than, ink on paper, 18 in x 24 in, 1998. Greater Than/Less Than (detail), ink on paper, 18 in x 24 in, 1998. Depict/Recall, pen and ink on paper with collage, 18 in x 24 in, 1998. Depict/Recall (detail), pen and ink on paper with collage, 18 in x 24 in, 1998. Primer III, ink, stitching, transfer-lettering, and watercolor on paper, 7.5 in x 9.75 in, 1998. Primer III (detail), ink, stitching, transfer-lettering, and watercolor on paper, 7.5 in x 9.75 in, 1998. Four In One, stitching and ink on paper, 8.5 in x 11 in, 1998. Three In One, stitching and ink on paper, 11 in x 8.5 in, 1998. Wonderland, ink, cloth, stitching on paper, 8.5in x 11 in, 1998. The series titled, Words And Pictures treats of similar themes as From The Nursery but does so in a manner that I think is more stark and less narrative. Recurrent symbols, such as an empty child’s dress, a lush and sexually insinuating orchid, and the figure of a zebra (through a tangled web of associations, the zebra has come to be equated with the immigrant who lies to compensate for her broken narrative) are paired and played off against more common images of childhood such as Disney’s characters and the words from nursery rhymes. In its entirety, Words And Pictures will be composed of twenty-seven works on paper. Each drawing is made entirely by hand. The commercial images are never traced, nor are they transferred. Sewing into paper, writing and recollecting upon paper, stippling paper and agitating paper with ink and needle creates an obsessive surface quality that I hope acts as a metaphor for memory itself; and for memory’s tendency to agitate, to poke and to be embellished.